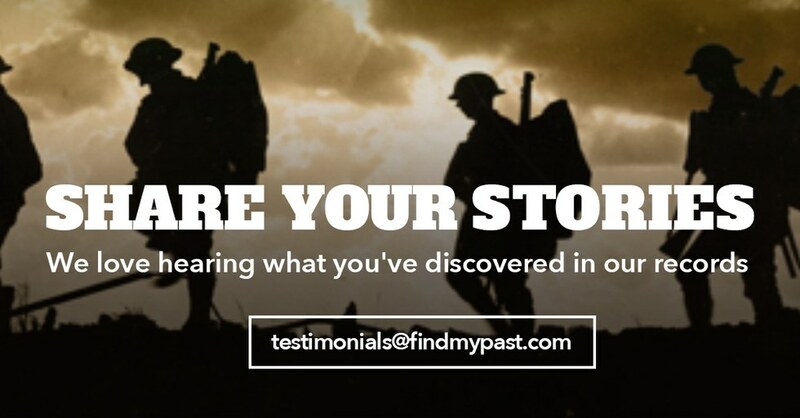 Findmypast member Carla Martin proves that persistence pays off when it comes to tracing elusive army ancestors. I'd been hunting for my grandfather - Joseph Charlie Martin's - World War 1 records for years with no success. The problem had always been that while I found things which appeared to match him, I was always unable to prove it. I could find the same names, but never any service record which could have given an address or next of kin. I knew where he'd served, and had found one or two names in the Medal Index Records which seemed to be possibilities. I asked my family about a few of them, and one record in particular that had caught my eye. My grandfather, Joseph Charles Martin, had volunteered underage. We'd been told that his mother had written to the War Office to get him returned home, but then Joe re-joined when he was old enough. I wasn't sure if he'd have had the same service number for both times he joined. This record had the same service number and two ranks. The problem was one rank was Dvr – driver. Everyone had told me Joe couldn't drive, so this record was put aside as wrong. Maybe I should've thought about the type of vehicles which would have been 'driven' in WW1… Too much modern thinking! That was over three years ago. More recently however I was entering all my family World War 1 record details onto commemorative sites, and so I returned to the mystery of my grandfather. It remained extraordinarily frustrating. I even asked on the Findmypast community, but even though lots of ideas and suggestions were given still the concrete proof of which record matched my grandfather eluded me. It was extraordinarily frustrating. Then, Findmypast advertised a free weekend. I thought "Okay, I'll just have a peek". I knew the site has been adding a lot of new records this year but hadn't checked any of them. Can you imagine my joy when the first military record I checked, one of the new releases, was a match for my grandfather? I literally screamed to my husband that I had found a match! I checked the details of his next of kin, it matched my great grandfather. Not only that but would you believe it, the record matched the one that stated Dvr. Can you imagine my joy when the first military record I checked, one of the new releases, was a match for my grandfather? I literally screamed to my husband that I had found a match! The last piece of proof was that one of the new records showed both his World War 1 and 2 Service Number. I had his WW2 Service Number on my aunt's birth certificate, born in 1939. It was a match many times over. Since then I've spent a lot of time looking up more records with his WW1 Service Number and have learned heaps. For example, it seems my grandfather stayed in the army after World War 1 ended, but his Medal Index Card states he deserted on the 22nd April 1920. As a consequence his 1914/1915 Star was scrapped, although it appears he was still given the Victory medal and the British War medal. I've sent a request for his service records to find out more. I so feel relieved. Two days before Remembrance Sunday, and a few days before Armistice Day, I found my grandfather's World War 1 records. It feels rather poignant, and almost like a conclusion, although the search for more information goes on. This has also been a steep learning curve... Findmypast is definitely the best family history research site, and even though I received the emails telling me new records had been added I didn't look at them until this weekend. I could kick myself!